At age six, John Wesley was rescued from a burning room in his father's rectory, depicted here in this 19th century engraving. The dramatic incident caused him to refer to himself later in life as a "brand plucked from the burning." Not all American ministers were swept up by the Age of Reason. In the 1730s, a religious revival swept through the British American colonies. Jonathan Edwards, the Yale minister who refused to convert to the Church of England, became concerned that New Englanders were becoming far too concerned with worldly matters. It seemed to him that people found the pursuit of wealth to be more important than John Calvin's religious principles. Some were even beginning to suggest that predestination was wrong and that good works might save a soul. Edwards barked out from the pulpit against these notions. "God was an angry judge, and humans were sinners!" he declared. He spoke with such fury and conviction that people flocked to listen. 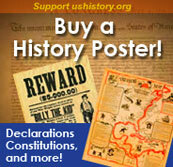 This sparked what became known as the Great Awakening in the American colonies. George Whitefield was a minister from Britain who toured the American colonies. An actor by training, he would shout the word of God, weep with sorrow, and tremble with passion as he delivered his sermons. Colonists flocked by the thousands to hear him speak. He converted slaves and even a few Native Americans. Even religious skeptic Benjamin Franklin emptied his coin purse after hearing him speak in Philadelphia. Soon much of America became divided. Awakening, or New Light, preachers set up their own schools and churches throughout the colonies. Princeton University was one such school. The Old Light ministers refused to accept this new style of worship. Despite the conflict, one surprising result was greater religious toleration. With so many new denominations, it was clear that no one religion would dominate any region. 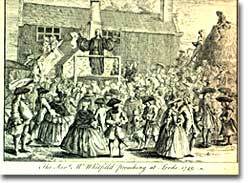 The dramatic George Whitefield preaching in the open-air at Leeds in 1749. Although the Great Awakening was a reaction against the Enlightenment, it was also a long term cause of the Revolution. Before, ministers represented an upper class of sorts. Awakening ministers were not always ordained, breaking down respect for betters. The new faiths that emerged were much more democratic in their approach. The overall message was one of greater equality. The Great Awakening was also a "national" occurrence. It was the first major event that all the colonies could share, helping to break down differences between them. There was no such episode in England, further highlighting variances between Americans and their cousins across the sea. Indeed this religious upheaval had marked political consequences. A comprehensive online biography of the great preacher. The page is generic — no pictures, no design, no frills — just pure information. And the information is very good. Jonathan Edward's "Sinners in the Hands of an Angry God" is one of the most famous sermons of all time. Have a look at the full text. A very nice overview of the Great Awakening and its impact on America. There is lots to read here. The Internet is about finding information, and what you'll find here is quite useful. Written by an AP history student from Connecticut, and published by the Concord Review, this examination of the Great Awakening is the type of work that makes teachers drool. It's a fantastic overview of the root causes and repercussions of the Great Awakening. Gesturing dramatically, sometimes weeping openly or thundering out threats of hellfire-and-brimstone, they turned the sermon into a gripping theatrical performance. 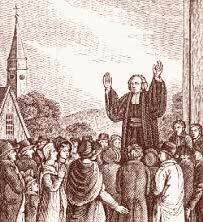 Read about the preaching style of George Whitefield.